Product #16386 | SKU 2213 | 0.0 (no ratings yet) Thanks for your rating! 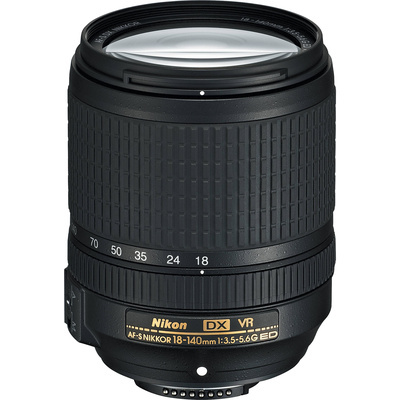 The Nikon AF-S DX NIKKOR 18-140mm f/3.5-5.6G ED VR Lens is a multi-purpose zoom lens capable of wide-angle and telephoto imaging—and everything in between. This all-in-one NIKKOR zoom lens is compatible with DX format cameras, and it features an extra-low dispersion (ED) glass element in addition to an aspherical element that help to improve edge sharpness and clarity while correcting chromatic and geometric distortions. Its combination of high-quality optics and a broad zoom range make the 18-140mm an ideal go-to lens for travel and other tasks that demand functionality without sacrificing portability. Nikon's Silent Wave Motor (SWM) autofocus mechanism provides near-silent auto focusing that is both fast and accurate. Combined with Vibration Reduction (VR) image stabilization, the SWM AF system equips the AF-S DX NIKKOR 18-140mm for handheld video recording as well as fast-action photography. Additionally, manual autofocus override allows instant switching to manual focus without taking your eye off the subject of interest. A 1.48 ft minimum focus distance and f/3.5 maximum aperture permit macro-style shooting that yields shallow depth of field with pleasant out-of-focus detail. Compatible with DX-sized image sensors. The 7.8x magnification ratio provides a versatile 18-140mm zoom range (27-210mm equivalent) covers close-ups, portraiture, and telephoto imaging. Vibration Reduction can provide up to four stops of image stabilization for sharper handheld photos and video. One aspherical and one ED lens element reduce chromatic aberration and help improve image sharpness, clarity, field flatness. The Nikon Super Integrated Coated lens system enhances light transmission and reduces lens flare. The Silent Wave Motor autofocus mechanism provides quick, quiet and precise auto focusing. Manual focus override allows instant switching between AF and MF focusing systems for greater control of focus placement.